What better way to spend a beautiful sunny day than a trip down memory lane! 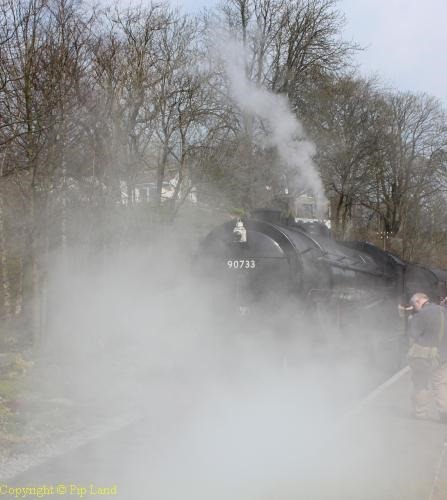 And we certainly did that when we visited the Keighley and Worth Valley Railway (KWVR). Both David and I remember the days when we had to travel by train, bus or trams as our parents did not have cars. I was about four-years-old when, equipped with my own little suitcase, I travelled with my parents and two brothers, by bus to Tilbury docks. There we took the ferry to Gravesend so that we could catch the train to Sheerness. The carriages we travelled in on the KWVR were just a little younger than the single compartment carriages on that journey to Sheerness. And they were very comfortable. “Those old carriages were comfortable – much more than the modern ones with their thin seats and poor leg room,” David said. He had to remind me of that when I tried to get out at Keighley station. That station he said was a smaller version of the one he often used at Sheffield. There was even the box type WH Smith kiosk with its rounded corners painted toilet brown. “The only thing missing was the little aluminium name plate maker,” he said. “I used to put a penny in to make one. I remember doing that a couple of times at Sheffield station because I wanted a name plate on my Scouts stave. “That sort of thing you forget and then it bounces back into your memory. I was in a sort of sensory overload with the sounds, the smells and the feeling of riding in those carriages. And there was not only the sound of the (steam) loco but also of the non-welded tracks, going over the points and the clickety clacking. This was his first journey on that railway – but not mine. I especially noticed the wind turbine towering above us as we left Oxenhope and the large new housing estate at Damems. But the dust and grime on one’s face after hanging out of a window when behind a steam locomotive definitely hadn’t changed. That did bring back memories of travelling across India by train in the 1970s. Another very important feature of the KWVR which hasn’t changed is the friendliness of the staff. Those volunteers helped to make it such an enjoyable day as they were so helpful and knowledgeable. We did take the opportunity to visit the museums at Ingrow West. The Museum of Rail Travel was especially interesting as it was possible to explore several beautifully restored old carriages – and to sit on the armchair-like seats in an early 1st class compartment. And on our return to Oxenhope we visited the Exhibition Shed where there is a collection of locomotives and rolling stock. To provide a special ending to a great day out David then treated me to supper at the George and Dragon at Aysgarth and as usual we had an excellent meal.